The Mountain West Conference had a great campaign last season, finishing No. 7 in the RPI and getting three single-digit seeds into the NCAA Tournament. Moreover, it had a fantastic race for first-place, as New Mexico had to go into BYU and knock off the Cougars in the next-to-last game of the season in order to win the MWC outright. The Lobos finished 14-2, with BYU going 13-3. UNLV and San Diego State each went 11-5, with no one else finishing above .500 in the league. The conference tournament saw the top two seeds get knocked off in the semifinals, with San Diego State defeating UNLV in the title game. The top four teams reached the NCAA Tournament, with BYU and New Mexico advancing to the second round. Expect another great race with the top four. 1. San Diego State: The Aztecs have one of the best frontcourts in the country in Kawhi Leonard, Malcolm Thomas and Billy White. D.J. Gay and Chase Tapley return as starters in the backcourt. 2. 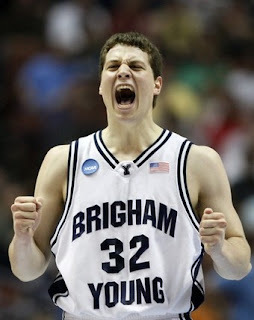 BYU: Jimmer Fredette is back for the Cougars, so they will have a chance to beat anyone in the country. He combines with Jackson Emery in a great backcourt, but they need frontcourt production. 3. New Mexico: The loss of Darington Hobson hurts, but Dairese Gary and Philip McDonald are solid in the backcourt. Transfers Drew Gordon and Emmanuel Negedu will help up front. 4. UNLV: The Runnin’ Rebels are carried by their deep perimeter group that includes all-conference candidates Tre’Von Willis and Chace Stanback, as well as Oscar Bellfield and Derrick Jasper. 5. Colorado State: The Rams will have to learn how to beat the top-four teams if they are to move up in the standings. Three double-figure scorers return, while Iowa State transfer Wes Eikmeier will help. 6. TCU: The Horned Frogs could surprise a bit this year, behind all-conference guard Ronnie Moss and Virginia Tech transfer Hank Thorns. Sammy Yeager is a JC transfer that could be a sleeper. 7. Wyoming: With the return of Afam Muojeke from injury, the Cowboys have a bonafide inside-outside duo with Muojeke and guard Desmar Jackson. Adam Waddell is solid down low. 8. Utah: The Utes don’t return much from last season, but they have nine newcomers who will be counted on immediately. The top returnees are shot-blocker extraordinaire David Foster and forward Jay Watkins. 9. Air Force: The Falcons won just one conference game last season, although much of that can be attributed to injuries. They need to immediately improve the offense, led by Grant Parker and Evan Washington.